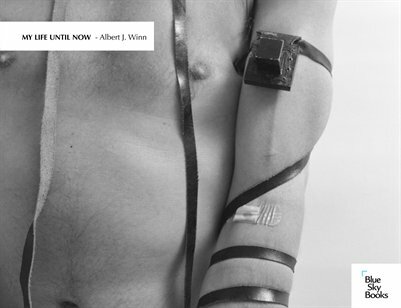 My Life Until Now by Albert J. Winn is an autobiographic project of photographs and short stories spanning 3 decades. Winn, a seemingly robust survivor of HIV/AIDS, lived with the illness for more than 30 years before succumbing to a rare and aggressive cancer at the age of 66. Seen within the context of a 28-year relationship with his husband Scott Portnoff, the 50 images and 9 text panels address personal relationships, Jewish religious and cultural identity, family, illness, sexuality and memory. The text panels are excerpted from 7 short stories that accompany the book: My Name, Appendicitis, Hawaiian Aliyah, Cafe Figaro, Until Now, T'shuvah and Germany. An essay entitled "Albert Winn's Life Until Now: An Appreciation" penned by long-time friend Jeffrey Shandler (Professor of Jewish Studies, Rutgers University) appears along with a eulogy by another close and long-time friend, Kim Lee Kahn (M.A. Cal Arts). Blue Sky Gallery showed Al's work in May 2014.